It is apparent to me the fighter pilot community is max performing their culture as they max perform their jets. They should be commended for this aggressive attitude and their mission hacking perfectionism that seeks to squeeze every inch of motivation from their people during challenging times of do ___ with less. But the line has been traversed, it seems to me, and the air has already started to seperate from the wing. The community is no longer max performing its culture. Instead, they are stalling it out. It is evident to me that instead of maximizing people for the betterment of the mission, the aggressive fighter pilot culture is failing to supply the creativity, debate, and discussion necessary to help the Air Force recover from a deep stall (some might argue a spin). Instead, the homogenized community is "staying the course" with the assembly line talking points and refusal to engage in serious discussion--in much of my experience at any rate. It can't be easy to max perform a culture. But we need to keep the fire trucks from rolling. I'm writing the first draft of my thesis and have tenatively entitled it, "The Smartest Guys in the Room and the Best of the Best: An Exploration of Air Force Culture" and hope to have a good draft by the end of the week. I want to reiterate my gratitude to my critics. I have actually used some critiques already in the writing. I hope the criticisms continue and I'll be posting brief items here throughout the week asking for criticisms and different viewpoints. So my question to my critics are: Are these good sources for the description of fighter pilot culture and are there any other modern sources that I should use in addition or instead? I want to be sure to use objective sources for my description of fighter pilot culture instead of putting my own bias into the analysis and I think both these sources are great for those purposes but I don't want to miss out on any modern sources that might tell a different story for a more complete picture. Also for your consideration and discussion are these three quotes from the American Fighter Pilot reality TV show. What exactly is the role and proper place of the social life within the fighter pilot culture? Assuming a baseline Air Force officer that has already been theoretically vetted for ethical and basic social skills, what more is required to be integral in the fighter pilot community? Any sources that I can use to support your viewpoint are much appreciated. "No matter how good these guys might be in the jet, if they can't fit in socially they can't be an American fighter pilot and in this course that means you won't graduate." "It doesn't matter what you drive, it doesn't matter how you look the only thing that matters is being able to successfully execute in this weapons system and be an integral part of our community. That's what matters." "If we don't respect a guy or don't like a guy so much, it makes it difficult for us to put that trust in him or to put our lives in his hands." "We have forced anyone with a bone to pick with us to find an alternative to high-end, conventional war. We’ve had to invent a vocabulary for this low end: 'asymmetrical' conflict, it being another poorly understood activity. But it seems clear that in this sort of war our existence is not threatened, that we can regulate the resource input. It can be expensive in men and material, but we cannot be defeated militarily." I have to disagree with the General on the clarity he claims for asymmetrical warfare not threatening our existence. There are a number of ways that it could change our existence. Such warfare might act as the catalyst for internal strife which could change our national character as we continue to forget what makes our country great (a higher standard, lamp on the hill, the love of liberty). It can threaten us financially as we pour money and treasure into an endless pit reminiscent of that which felled the Soviet Union. The General might argue against my points stating these are further reasons why we should end these "skirmishes" and concentrate on the big industrial fish. Unfortunately there is a more direct counterpoint to the General's assertion that asymmetrical warfare cannot defeat us militarily and it involves chemical and nuclear weapons. It would be a grave mistake to minimize this difficult warfare in order to continue to train for the easy warfare at which we excel. 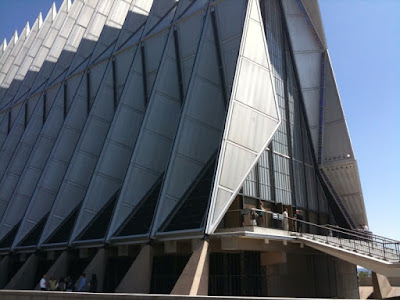 I just got back from a beautiful wedding at the Air Force Academy chapel to witness a principled young friend make an important life decision. The chapel is as gorgeous as has been described to me and despite lacking much of an artistic streak I really enjoyed viewing its design. The structure's sharp edges and solid metallic form remind me of something Howard Roark might have crafted. The stern almost surgical composition of the building in my mind represents an unwavering, objective and principled morality such as that demanded by the institution's honor code. The beautiful integration of the stain glass reminds me of our imperfect human natures and the expanse of open glass highlights the importance of light and transparency. The transparent light streaming into the structure illuminates the structure and greatly magnifies its brilliance. It seems to me that this structure, like the integrity and morality it represents, requires this light. First I want to give sincere thanks to those that commented on my previous post. That essay was written some time ago for an ACSC/DL class as part of PME discussion. It wasn’t part of an assignment but rather was an attempt to start a discussion with my peers and especially those from the fighter side of the house. As the comments in the previous post demonstrate, it wasn’t a model of research or academic inquiry and has several flaws. For those reasons I had no intention of posting it here. But a fighter pilot critic wanted to see it so I strapped on a thick skin, posted it, and took some well deserved spears. I believe its main claim that UAS are more capable and cheaper than manned counterparts and can be realized more quickly if cultural and political changes are made in the Air Force remains unblemished. The recently released Air Force “UAS Flight Plan” report paints a similar vision. Still my diatribe was weak in several areas and the commentary of several on this blog highlighted them. I thank them for their criticism. That was the process that should have taken place in my online PME discussion but for the most part did not. Instead of having my views challenged and the weaknesses of my assertions highlighted, the ACSC/DL process resulted in an F-15C pilot privately telling me I should talk to my OG/CC to have my views challenged after sending my views out to poison my chain of command. Ironically, instead of conventionally debating me online or in person he chose the asymmetrical approach of fighting me using the “bro network.” Like an enemy that surrounds and fades into the crowd… Such asymmetrical battles allow for a less capable foe to turn his adversary’s strength into a weakness. These encounters are typically political in nature even when they take on the violent dimension. As might be imagined, politics is not my strong suit. Asymmetrical fights are essentially about ideas and values and require dialog, honesty, self-reflection, and creativity to win and I think I have some strengths in that area. But the political reality of such conflict strongly dictates that being right doesn’t guarantee success. Some have and will claim my detailing of the academic freedom violation is merely whining. I think it’s more than that. I recently learned from an anonymous source that one of the email chains actually went from a CSAF executive officer (F-15C pilot) to a group of Eagle Drivers and then found its way directly into my chain of command. Email chains have popped up from the original violation and have found their way throughout my current command and despite its widespread proliferation not one person has contacted me about the discussion (other than my boss at the direction of a two-star). Even when I directly email the participants of chain emails provided to me and extend an invitation for a professional discussion to the writers I get no response. Many have shown willingness to negatively comment, insult, and pass along emails but have avoided any serious discussion of the ideas with me. If Air Force officers refuse to debate professional differences how likely is it they will be able to bring the leadership skills necessary to win the hearts and minds warfare we find ourselves engaged in now? And what is the role of our Professional Military Education in providing these skills to officers charged with winning our nation’s wars? My professional discussion in my ACSC/DL course turned into a hit order spread across the Internet--exactly the kind of thing Air University academic freedom policy is supposed to prevent but did not. In fact, the F-15C pilot wasn’t even removed from the class despite admitting his violation even after evidence his actions infected my chain of command at the two-star level. My year in the program has demonstrated without question that ACSC/DL does not value academic freedom. That “institution” is a poster pinned to a cardboard backing with no structure or substance behind it. It is an empty shell of a program that epitomizes perception at the expense of reality and likely does more harm to the education of military officers than it does good. It is only after ACSC/DL leadership refused to remove the student from the class that I realized the program was rotten to the core and I would have to find another way to discuss ideas with peers. This blog was born of the failure of ACSC/DL to provide a basic forum for military officers to discuss and share their experiences and thoughts. The petition for redress for my academic freedom violation was elevated to the Air University level a month and a half ago. There has still been no resolution to the issue and as far as I know the F-15C pilot hasn’t been removed from courses where he is still free to issue hits on anybody he disagrees with. I can’t help but wonder how long it takes to investigate a case with a smoking gun and a signed confession.